8D/7N MEDAN – PADANG: NORTH TO WEST SUMATRA OVERLAND Day 1 : Kuala Namu - Medan – Brastagi (Lumbini Natural Park) Welcome to Medan! Upon arrival at Kuala Namu Airport, you will be welcomed by our guide and depart for a brief city tour to Maimoon Palace and Chinese Temple. Depart for a 2-hour drive to Brastagi, a highland resort with its refreshing weather and magnificent mountain scenery, passing through the lush tropical rainforest of Sumatra. Reaching Brastagi, stroll along the Lumbini Natural Park and see the replica of Schwedagon Golden Pagoda from Myanmar. Stop by at the vibrant Brastagi Fruit Market before check-in at hotel. Day 2 : Sipiso piso Waterfall - Parapat – Samosir Island Depart to Parapat where you’ll stay at a famous lake resort lies on the east shore of Lake Toba. Visit the traditional Batak village and proceed to see the slender Sipiso-piso Waterfall drops into the northern tip shore of Lake Toba from hundred meters height. Next, we’ll visit the ancient King’s Palace of Simalungun at Pematang Purba and depart to crossover to Samosir Island. En route you will pass by fertile vegetable and fruit farms, pine tree forest and spectacular view of Lake Toba along most part of the journey. It takes 45 minutes to cross over by public ferry and you will overnight at Samosir Island. Day 3 : Samosir Island Tour After breakfast, we’ll kick start the day with Samosir half-day tour. Visit the famous Tomb of King Sidabutar and Batak Toba Village at Tomok. Then check out Ambarita, a traditional village with ancient megalithic furniture in front of the traditional house, followed by a folkdance performance by Batak Toba people in Simanindo Village. Return to hotel and enjoy free time for the rest of the day. Day 4 : Samosir – Balige - Sipirok / Padang Sidempuan Today we will return to Parapat and begin the first part of the trip to West Sumatra. We’ll journey through Lumban Binaga Village and the small Balige town with its richly ornamented market building. If the season is right, take time to peek around the local’s spice garden as we en route to Sipirok / Padang Sidempuan for an overnight Day 5 : Sipirok / Padang Sidempuan – Bukittinggi The journey today is rather long but it will worth your time. We’ll take the long scenic road, exhibiting the glorious sceneries of mountains, rivers, valleys and the traditional villages. Passing through The Equator Monument before proceeding to the charming Bukittinggi – the heart of Minangkabau Highland and the center of matrilineal society of Sumatra. Overnight at Bukittinggi. Day 6 : Bukittinggi City Tour – Ngarai Sianok - Pagaruyung Have a fun journey today on a full day tour to explore the beauty and the cultural portals of Minangkabau culture. See the iconic “Clock Tower” – the landmark of Bukittinggi, the vibrant local market and exotic museum, followed by a visit to Koto Gadang to view their renowned silver works and hand embroidery. Moving on the next favorite destination - the Sianok Grand Canyon (Ngarai Sianok) where you will be treated with wonderful view of lush canyon, green valley paired with majestic stone cliffs. Travel further to Pagaruyung – site of the ancient Minangkabau Kingdom where women ruled in matrilineal society. Return to the hotel for free activities Day 7 : Embun Pagi – Anai Valley - Padang Today’s tour will allow you to unwind as you enjoy the exquisite view of West Sumatra. Travel to Embun Pagi Viewpoint for an exclusive breathtaking view of Lake Maninjau. Proceed for a 3-hour drive to Padang - the capital city of West Sumatera province – and stop over at Anai Valley to enjoy the gorgeous waterfall and lush greeneries of Anai Valley Park. Arrive to Padang for check in and leisure at your own time. Day 8 : Transfer Out to Airport After breakfast, feel free to do your own activities until our guide picks you up for airport transfer. We trust you had a pleasant trip and sincerely hope to see you again on your next trip! 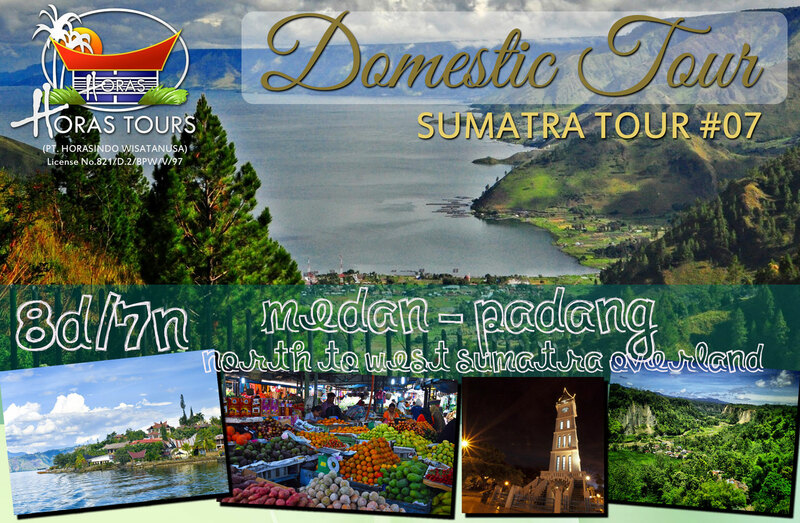 Please enquire with us with your travel needs to get comprehensive price for Sumatra 7 tour package. Feel free to contact us for special tour arrangement.